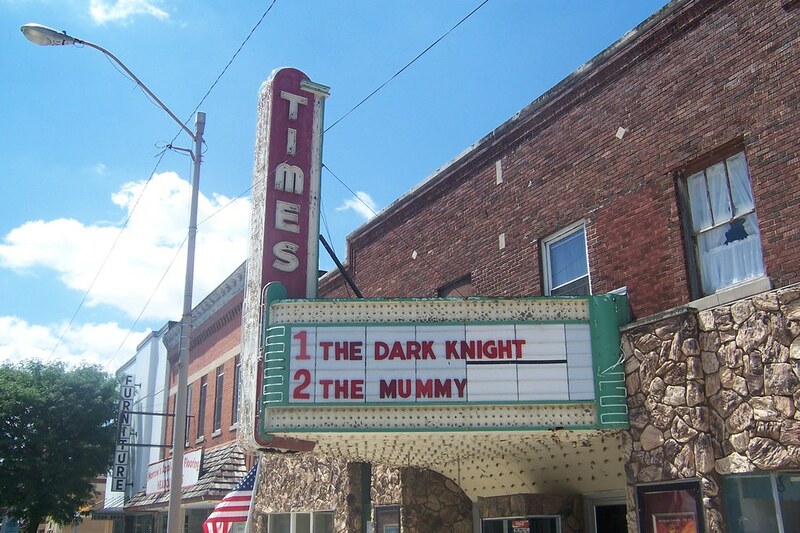 This is the Times Theater, on the Michigan Road in Rochester, Indiana. At least, this was it in 2008, while it was still operating. The Times showed movies for 90 years, but owners couldn’t afford a digital projector and had to close it in 2014. 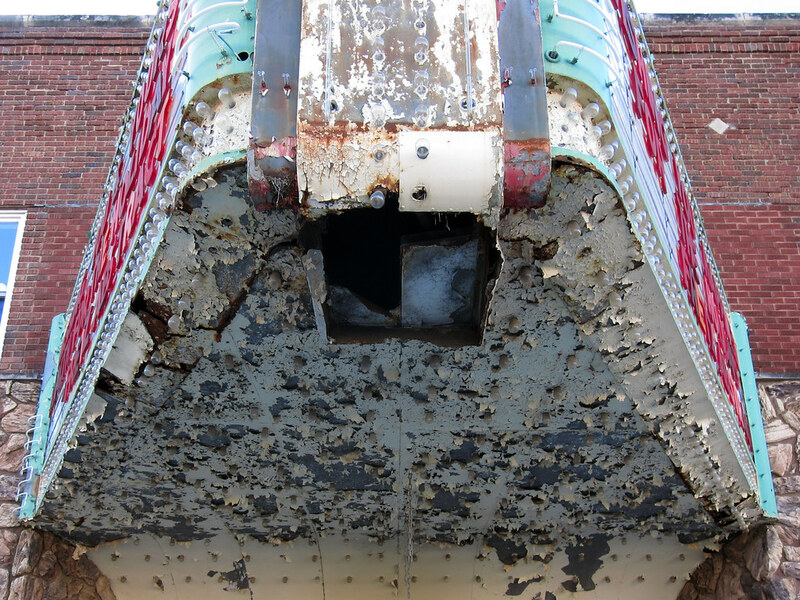 This marquee was already showing strong signs of rot in 2008…but look at it now. This poor old sign. Here’s a closer look, first 2008 and then 2018. Fortunately, a non-profit group has organized with a goal to restore and reopen the Times as an art and entertainment center for the community. Their Facebook page is here. Here’s hoping they can achieve their goals — and see this sign restored, if it’s not too late. I like to see old theatres restored. In particular, I like to see organs replaced or restored. The Rivoli Theatre in Indianapolis became an almost total loss, and I think plenty of money may bring it back. 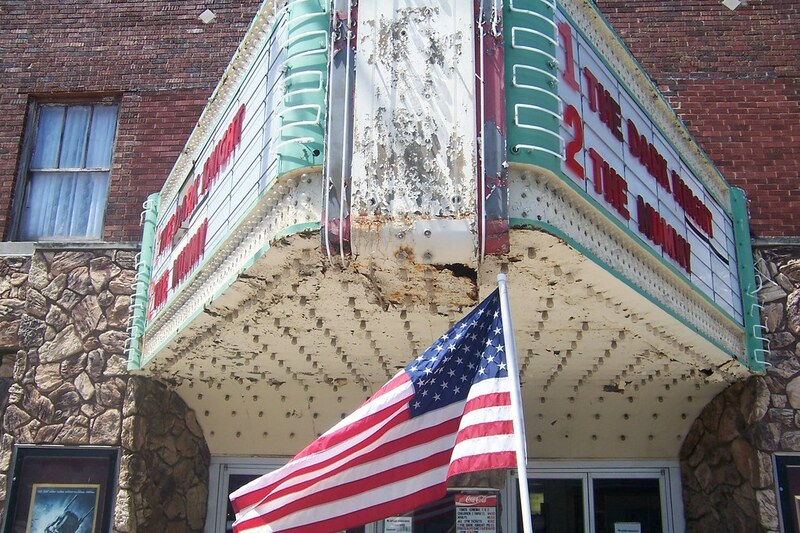 A theatre in Steubenville, Ohio is on a faster track to rehab. This city was the birthplace of Dean Martin. The work on the Rivoli is astonishing given how bad the building became. It’s interesting how attached we become to our old theaters. I became acquainted with movie palaces when I found a new book in the library named “The Best Remaining Seats” by Ben Hall. The original glossy paper version is the best, and I have a copy from that era. I met Ben Hall when my late father and I were in Chicago in 1969. We were in the Aragon Ballroom, and Ben arranged for a small group of us to see the Uptown Theatre nearby. That theatre is also scheduled for restoration after being closed for about 30 years. I’ve been to the Aragon Ballroom! Saw a concert there in the mid-late 80s. I’m so glad someone is taking on this project! I have a weakness for old theaters and great signage. Have you been to the Astra down in Jasper? A group rehabbed this theater- it wasn’t restored but they kept as much original as they could. They had to strip the theater down to the exposed brick. It’s a lovely space but I was still a little sad they couldn’t salvage more. They have a great sign too. The theaters of the classic era evoke a connection in us that the modern multiplexes sure don’t. 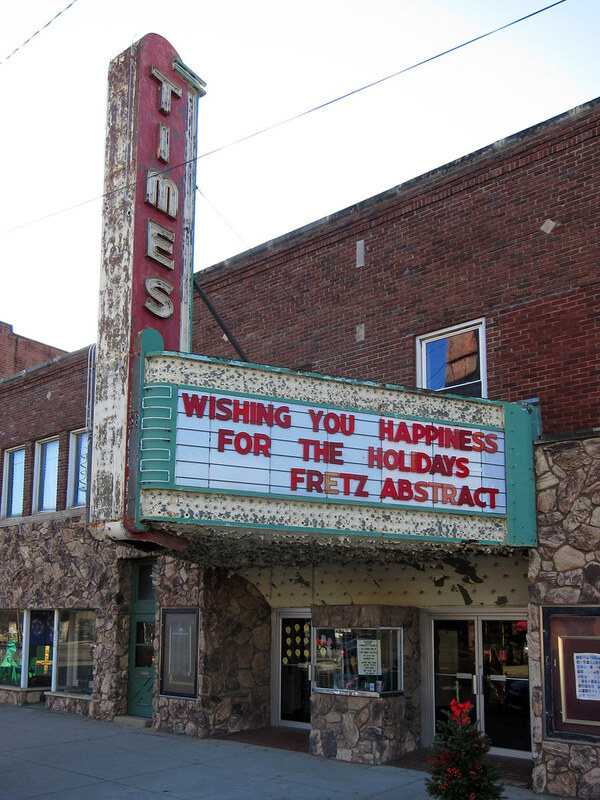 It’ll be great to see the Times sign restored and lighted one day! I haven’t been through Jasper to see the Astra. I think I’ve been to Jasper only twice in my life, glancing blows on the edge of town. The square also hosts a fabulous old hardware store that I loved and wrote about. I am from southern Ohio and really enjoyed my long weekend spent wandering around Jasper and nearby Vincennes. It’s a beautiful area. Ooo you got to see Pokey LaFarge! I’ve seen him twice. So much fun. He was fantastic! It was a solo performance- just him and his guitar. The Honey Vines opened for him and they were great too! I’d love to see him solo! I’ve seen him with the South City Three and with a slightly larger band and both were knockout performances. You really should see him solo. I absolutely loved it. Learned another thing on the internet today. Never heard of Pokey LaFarge before, great stuff! He’s a fun performer! Glad you like him! Good idea, they are doing the same thing here with the Westdale theatre. Restoration is almost complete and they’re starting it up with a screening of Casablanca. This is great, the last film I saw there (Tree of Life – Ugh!) the decomposing seat I sat in way very distracting. Ew. Here’s hoping the seats are much nicer for their opening night! Those last two images really summarize the story, don’t they. How wonderful that a restoration effort is underway, though; I do hope it will be successful. Me too. I have no idea whether the theater inside is anything special but that sign sure is. Building not so bad but the sign is where your eye is drawn. Cheap paint now peeling off. Now I have some paint, typically used on aircraft carriers, which will not peel like that at all. Only thing is that you have to like Haze Gray and what Navy sailor doesn’t except those who do the scraping and needle gunning on rusted spots. My dad and my dad’s dad were Navy so I’m sure I have Haze Gray in my blood somehow. Since Rochester is where I grew up, I spent many hours at the Times Theater. It is sad to see it in such shape. Hopefully they will be successful in saving it. Hours spent watching the latest movies (sometimes a double feature) back then …. after the news reels and a cartoon or two and the trailers of the upcoming movies. I remember standing in a line that went to the end of the block and halfway around, the night Psycho opened. What great memories! Thank you for sharing them. Seems like every little town in Texas had a theater like that. Fortunately a lot of towns (at least based on what I’ve seen locally) are actively keeping them in good shape or working on restoring them. Here in Austin we have the Paramount, which has been a major downtown venue for several decades. Lots of concerts, speakers, special events, even a summertime film series. It’s a beautiful theater. I’d love to do a Texas highway tour one day. Of course, I’d need two months off.